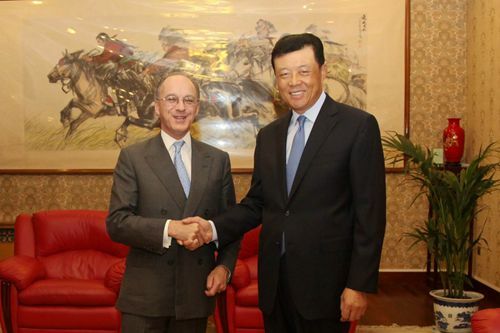 On September 25, Ambassador Liu Xiaoming met with Lord Sassoon, the new Chairman of China-Britain Business Council. Ambassador Liu congratulated Lord Sassoon on his new position and hoped that under his leadership, China-Britain Business Council will play a greater role in promoting the economic and trade cooperation between China and Britain and constantly accumulate positive energy for the bilateral relations. Lord Sassoon said he completed his first visit to China as Chairman of China-Britain Business Council not long ago. The trip left him with a deep impression that the business communities of the two countries are willing to strengthen cooperation which holds great promise. The China-Britain Business Council and he himself are willing to make positive contribution to the development of UK-China economic and trade cooperation and overall bilateral relations between the two countries.